1 to 1. That’s the average ratio of fruit to sugar in most jam recipes (commercial and homemade). I’m not going to lie, your standard jar of sugary homemade jam tastes divine, but do we really need to be starting our day with that much sugar? Is that really much better than handing my kids a donut for breakfast? Myth – You need sugar to preserve the fruit. Sugar affects the acidity that is crucial for safe canning. All fruits that are safe to water bath can with sugar are safe to water bath can without. I promise. All you need to do is add more lemon juice to boost the acidity. The number one rule of canning (unless you are a seasoned pro) is to follow a trusted recipe to the letter. I do not consider myself a seasoned pro, so it’s tested recipes for me – most of the time. Don’t worry, I’ll share my favorites in just a moment. 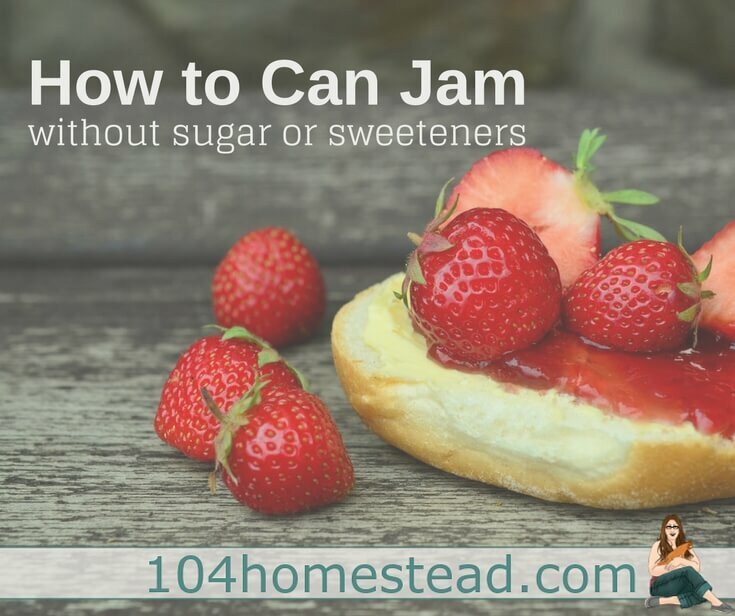 Sugar-free jams take longer to process, so again, follow those recipes! If you’re new to canning, you might want to check out my water bath canning FAQs. 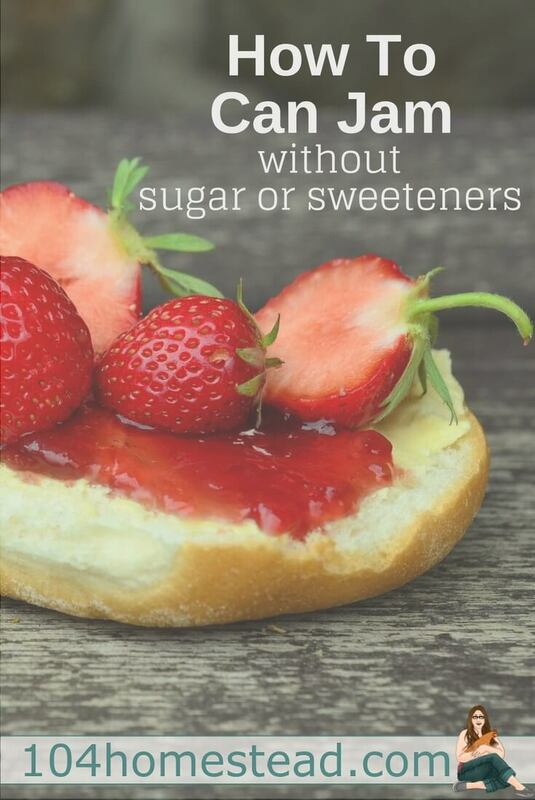 Myth – Your jam won’t gel without sugar or sweetener. 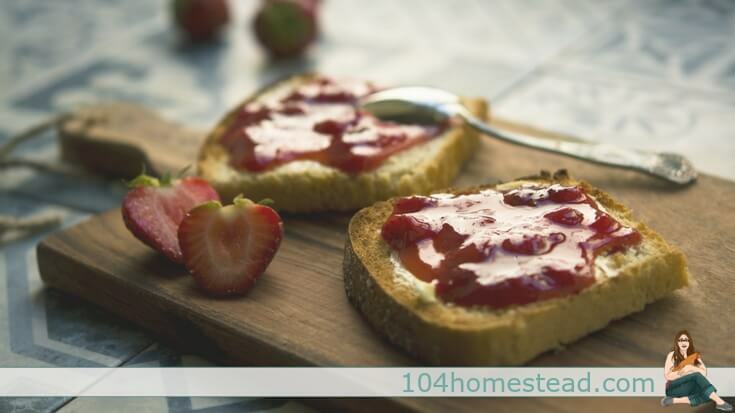 There is a misconception that your jam won’t gel without sugar. While that’s technically true, there are tricks to make your jam jammier without sugar. There are several no-sugar pectins available on the market: Ball and Dutch Jell. There is also Pomona, which uses calcium to create gelling. I really like Pomona’s pectin, but it takes an extra step to use and might not be right for a beginner. Simply Canning has a great real-world review on using Pomona’s Pectin worth looking at. Do not use inversion or open kettle canning! Myth – Fruit takes on a weird color when you can it without sugar. Sugar does keep fruit bright and colorful, but there are ways to keep your jam pretty without the use of sugar. Starting with the proper fruit is the first and most important step. Make sure your fruit is just reaching ripeness when you preserve it. This isn’t the time to use up those overripe strawberries you forgot you had. You want to use firm fruit. You can slow down fruit darkening by using a lemon juice or citric acid bath. Citric acid sounds scary and very unnatural, but it is a commonly used natural ingredient. To create a bath for your fruit, mix 3/4 cup lemon juice (or 1 teaspoon citric acid) to 1 gallon of cool water. Add your cut up fruit and give it a swirl around in the water for a bit. Once you’re sure all the fruit has been “washed” you can drain the water and proceed with processing. I washed my berries in a citric acid wash (except for the raspberries and grapes) before following these recipes. This recipe is a short-use jam that can’t be canned, but it’s great if raspberries are in season. It uses chia seeds to thicken. If you haven’t worked with chia seeds before, it absorbs fluids and turns into a jelly. Plus, chia seeds are loaded with fiber, protein, Omega-3 fatty acids and various micronutrients. Yay for the healthy boost! Strawberries are naturally sweet, so why mess with Mother Nature? This recipe is also for short-term use, but it lasts up to two months in the refrigerator in an air-tight container. Arrowroot powder is used to thicken the jam. I spent a long time thinking I didn’t like apricot jam. It was so sickeningly sweet! You know what this one tastes like? Fresh apricots – which apparently I really like. She uses Sure-Gel pectin in her recipe. I haven’t used that one, but I did have success using the Ball pectin I had on hand. She didn’t can hers, but I canned mine (I know, do as I say, not as I do). I processed for 15 minutes. Yes, you read that right. Jelly! I know we’re all about jams, but I had to include this one. I didn’t think there was any way to get juice (the basis of jelly) to set up without sugar. Boy, was I wrong. She uses an apple (which contains natural pectin) and Pomona’s for this recipe. Scroll down to see her jelly standing at attention on a piece of toast. For more great recipes I suggest checking out Preserving with Pomona’s Pectin. It’s not strictly sugar-free. There are many low-sugar or sugar-substitute recipes in there, but it’s also got some sugar-free gems. Do you know of any recipes that are savory and do not use any kind of sugar? The ones that use peppers for instance? I’m not looking for a sweet spread. I don’t want use any kind of artificial sweeteners. I would be happy to experiments based on a lose recipe and share my findings. Do you have a recipe for sugar-free apple jelly? Thank you. These are exactly what i was looking for! Do you have a sugar free blueberry jam recipe? I have been making grape jam without sugar and pectin. I have been cooking it until it turns to “jam”. I haven’t been able to find a recipe for grape jam without sugar that I can preserve in a water bath canner. I understand by your article that the jam needs citric acid or lemon juice added now order to safely preserve it. Can you offer any advice on this or a recipe? I don’t feel confident giving out canning advice (though I throw caution to the wind when I’m doing my own canning lol). Have you checked out your local cooperative extension? Those people are a great resource. Just got here but really enjoying your website. Thank you so-o-o-o muck.